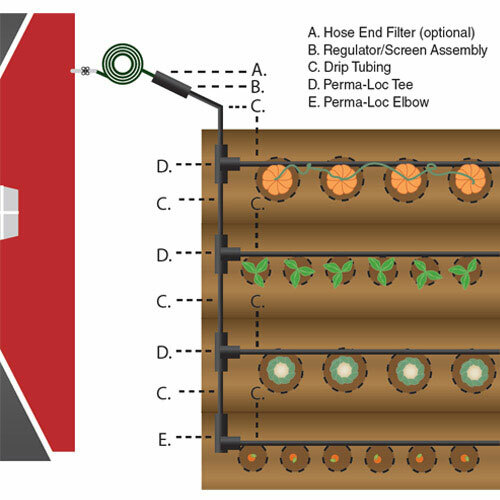 Drip Irrigation Kit for Gardens | Gurney's Seed & Nursery Co.
Give Your Plants the Perfect Amount of Water—No More, No Less! Convenient gardening aid saves 75% more water than conventional watering techniques! Easy-to-install drip method with perfectly spaced drip holes ensure plant roots receive plenty of water slowly and evenly. Kit includes 100 feet of Drip Tubing, one Regulator, one Perma-Loc Elbow and three Perma-loc tees. Fits a garden with 4, 22-ft. rows spaced 4 ft. apart or a 200 sq. ft. garden bed. Weighs 2 lbs.